Typist wearing mask, New York City, October, 16, 1918. Courtesy of the National Archives. On certain October mornings during 1918, masks like the one in the above photograph would have been a common sight on New York’s streets. Men and women wore them on their commutes to work, or even while doing their jobs, as office workers, postal carriers, and sanitation workers. Over 30,000 New Yorkers died during the 1918 influenza pandemic. And yet, because the city had learned from other contagious disease outbreaks and adjusted its public response and infrastructure accordingly, these numbers were comparatively low side-by-side with other American cities. A hundred years later, Germ City: Microbes and the Metropolis, opening today at the Museum of the City of New York, explores New York City’s history of battles with contagious disease. The exhibition is co-presented with The New York Academy of Medicine, in collaboration with the Wellcome Trust as part of their Contagious Cities project. Contagious Cities encourages local conversations about the global challenge of epidemic preparedness. Germ City tells the very personal stories of New Yorkers’ experiences and their responses to the threat of contagious disease over time using historical objects, oral histories, and artwork. Artist Mariam Ghani’s film, inspired by Susan Sontag’s Illness as Metaphor, invites audiences at the main gallery’s entrance to engage with the themes of metaphor and disease. Ghani’s work leads into the main gallery, where the stories of the some of the city’s many microbes—flu, cholera, diphtheria, the common cold, cholera, smallpox, TB, polio, HIV, and others —are explored through scientific models, historical objects, and contemporary artworks. Orders for hospitalization for Mary Riley, August 29–31, 1854. During the 1854 cholera epidemic, physicians visited the homes of the sick and issued orders for hospitalization, most hastily written on scrap paper. According to these notes, this patient, Mary Riley, delayed going to the hospital and died the following day. Letter from Mary Putnam Jacobi to Sophie Boaz, February 27, 1884. The impact of diphtheria, another devastating disease of the 19th and early 20th century, is crystalized in the compelling story of Ernst Jacobi, the son of Abraham Jacobi, the father of pediatrics and himself a committed diphtheria researcher. An 1884 letter in the New York Academy of Medicine’s collections, written by Abraham Jacobi’s wife, the physician and activist Mary Putnam Jacobi, documents the devastating death of Ernst from diphtheria. While this first section of the exhibition establishes just some of the contagious diseases that have hit New York over time, the remaining four sections of the exhibition probe the responses of the government, medical professionals, and ordinary citizens to the threat of epidemics. A common first response to contagion is to contain it. Visitors learn about New York’s man-made quarantine islands, Hoffman and Swinburne, and the exile of “Typhoid Mary” to nearby North Brother Island. These islands, now covered in overgrowth and closed to the public, are still visible from Manhattan’s shores. Jordan Eagle’s Blood Mirror, a sculpture created with the blood of gay, bisexual, and transgender men to protest the U.S. government’s ban on their donating blood, provokes viewers to consider the potential consequences of linking particular identities with disease and thus isolating populations. Jordan Eagles, Blood Mirror, 2015–present Artwork on gallery floor. On loan from the artist. The exhibition also explores the ways researchers, public officials, and ordinary New Yorkers have attempted to gather information in an effort to fight contagion. The Citizens’ Association of New York’s map of lower Manhattan illustrates the 1864 survey of New York households, conducted by physicians going door-to-door recording instances of typhoid, cholera, and other deadly diseases. 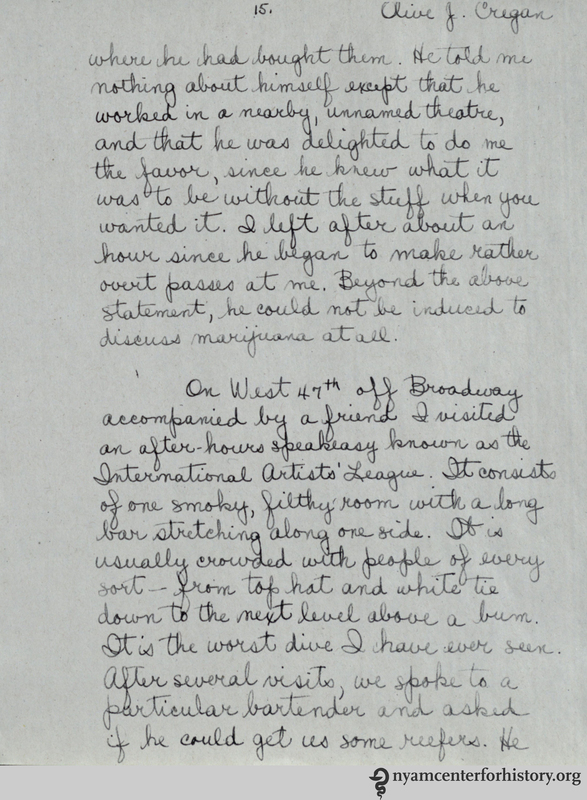 A copy of one survey, conducted by Dr. William Hunter, records the living conditions of a family of three recent Irish immigrants living on West 14th Street—all with typhoid fever. Science journalist Sonia Shah’s “Mapping Cholera” project illuminates the similarities between nineteenth-century New York’s vulnerability to cholera and more recent outbreaks in Haiti. Sonia Shah, Excerpt from Mapping Cholera: A Tale of Two Cities, 2015. Designed and built by Dan McCarey. Courtesy of the Pulitzer Center on Crisis Reporting. Postcard, Harlem Hospital. From the collection of Dr. Robert Matz. Over time, New Yorkers have been reliant on medical research, medicine, and family and professional caregivers to provide respite from disease. A collection of postcards from the Academy Library donated by retired physician Dr. Robert Matz depict key institutions where epidemiological research, treatment, and care were given in an effort to save the lives of the city’s sickest. Many of these facilities—hospitals, sanitaria, and health resorts—have been torn down or transformed over time, becoming another invisible layer in the city’s architectural history. New Yorkers sought care from old family recipes, as with Selma Yagoda’s recipe for chicken soup, and from patent medicines, cheap formulas widely available over the counter, which claimed to cure many ailments, including malaria and the Spanish flu. Germ City also engages with the ways cities create infrastructure and policies that support health. 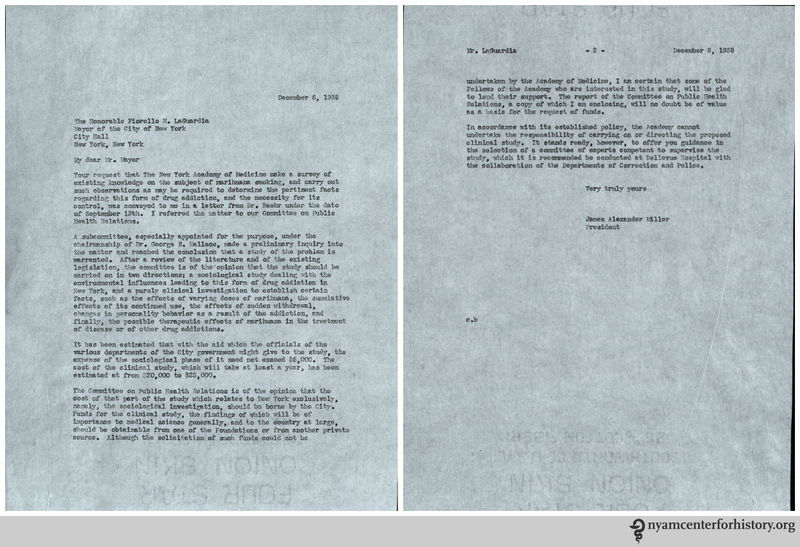 Public officials sometimes used creative delivery methods to communicate health information to wider audiences. In 1929, The Diphtheria Prevention Commission inundated the city’s subways and streets with placards and brochures in Spanish, Polish, Yiddish, and Greek, directing New Yorkers to get immunized for diphtheria. David Lynch’s 1991 “Clean Up” video offers a dark and at times surreal look at the city’s rat problem, illustrating the importance of public hygiene. A number of private and public organizations mobilized to minimize disease outbreaks through outreach and education. Following the main gallery, visitors are invited to engage hands-on with copies of collections materials in the “Reading Room,” in a range of formats (visual, audio, video). People can share their own family stories of disease through our public collecting initiative. For our October 18 festival, Art, Anatomy, and the Body: Vesalius 500, we exhibited items from the library’s collections showing the history of anatomical illustration. You can still visit the New York Academy of Medicine to view the exhibit in person on the ground floor. If you can’t make it, we offer a digital version below. The exhibit on display at the New York Academy of Medicine. In 1543, Andreas Vesalius was a 28-year-old professor of surgery and anatomy at the University of Padua, one of Europe’s best known medical schools. That year, he published his most famous work, De humani corporis fabrica, translated as On the Fabric of the Human Body. Vesalius dedicated the work to Charles V; he subsequently received the appointment of physician to the imperial family. Working from three images from the Fabrica—a skeleton, a figure of muscles, and an illustration of the brain—this exhibit shows the many ways Vesalius’ work built on past anatomists, and exerted its influence well into the future. Images from great works in our collection, from Magnus Hundt’s 1501 Antropologium to Dominici Santorini’s 1775 Anatomici summi septemdecim tabulae, show the evolution of artistic style and scientific understanding. 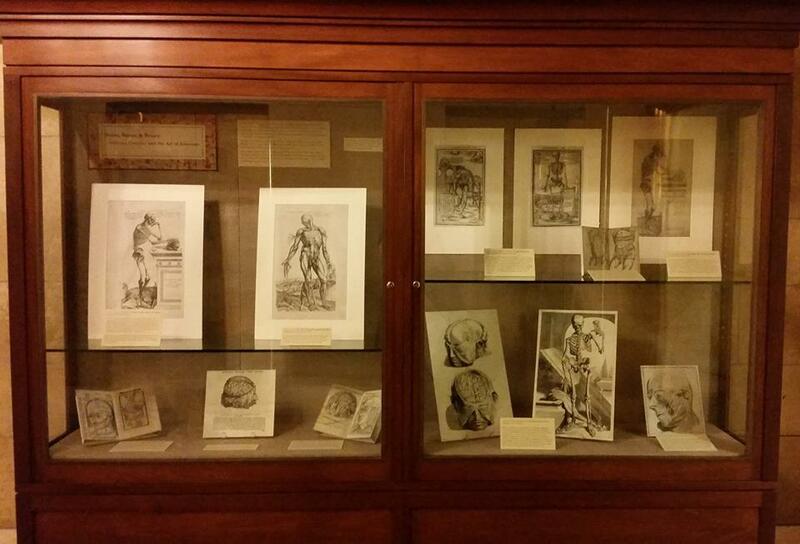 Some show examples of “borrowing” Vesalius’ images and placing them in new contexts. Andreas Vesalius (1514-1564). De humani corporis fabrica libri septum. Basel: Johannes Oporinus, 1543. Vesalius’ De humani corporis fabrica is a monumental work, notable for its departure from medical tradition, as well as its impressive woodcuts. As a student and young anatomist, Vesalius conducted numerous dissections. In doing so, he discovered that the second-century Greek physician, Galen—the absolute medical authority in Vesalius’ time—had made mistakes. Vesalius sought to correct these errors in the Fabrica, as well as demonstrate the value of dissection and first-hand observation in medicine. The volume includes over 200 images, depicting the smallest bones up to full figure views of human skeletons and musculature. In this skeletal figure, two ossicles of the ear, the hyoid bone, and another skull rest on the sarcophagus next to the skeleton. Andreas Vesalius (1514-1564). De humani corporis fabrica libri septum. Basel: Johannes Oporinus, 1543. The most famous illustrations are the series of fourteen muscle men, progressively dissected. Some figures, such as this one, are flayed. Hanging the muscles and tendons from the body afforded greater detail, not only showing the parts, but how they fit together. Andreas Vesalius (1514-1564). De humani corporis fabrica libri septum. Basel: Johannes Oporinus, 1543. The last section of the Fabrica is devoted to the brain, with illustrations more detailed than those in earlier works, such as Hundt and Dryander. Here, the dura mater has been peeled away, exposing the brain with its thin membrane and vessels. Magnus Hundt (1449-1519). Antropologium de hominis dignitate, natura, et proprietatibus: de elementis, partibus, et membris humani corporis… Leipzig: Wolfgang Stöckel, 1501. Magnus Hundt was a physician and theologian. His Antropologium, published in Leipzig in 1501, is a philosophical and religious work on the human body containing 17 anatomical woodcut illustrations. These are not the earliest anatomical illustrations, but they were the most detailed depiction of the organs created up to that point. The simple illustrations were intended as diagrams rather than realistic representations of the body and organs, and bones and muscles were not represented. The diagram of the head shows the three intellectual functions divided among three physical parts: common sense and imagination in the first, thought in the middle, and memory in the last. Johann (Eichmann) Dryander (1500-1560). Anatomiae, hoc est, corporis humani dissectionis pars prior… Marburg: Eucharius Cervicornus, 1537. Dryander’s work contains a series of woodcuts depicting the dissection of the brain, starting with the removal of the upper skull and continuing through the hemispheres, cerebellum, and skull base. His book also contains a diagram of the brain’s ventricles. Illustrations like these had appeared since at least the 1300s, and Dryander’s artist took inspiration from Hundt’s Antropologium. Dryander’s illustrations—including his brain figures—in turn influenced anatomical texts to come, many of which (like the Fabrica) showed the anatomy in greater detail. Charles (Stephanus) Estienne (1504-1564). De dissectione partium corporis humani. Paris: Simon Colinaeus, 1545. While Estienne’s work was published two years after Vesalius’, it should still be considered a pre-Vesalian anatomy. Estienne completed the work in 1539; it did not get printed until 1545 due to a legal dispute. Estienne’s woodcuts come from several sources and vary greatly in quality, both artistically and anatomically. Some were clumsily altered prior to printing. In the brain dissection plate, for example, the square section showing the open cranium was added or replaced after the completion of the full woodcut. The full-scale figure makes the details in brain structure difficult to see. Charles (Stephanus) Estienne (1504-1564). De dissectione partium corporis humani. Paris: Simon Colinaeus, 1545. While Estienne’s work was published two years after Vesalius’, it should still be considered a pre-Vesalian anatomy. Estienne completed the work in 1539; it did not get printed until 1545 due to a legal dispute. Estienne’s woodcuts come from several sources and vary greatly in quality, both artistically and anatomically. Eucharius Rösslin (d. 1526). The byrth of mankynde, otherwyse named The womans booke. [London: Tho. Ray[nalde]], 1545. The byrth of mankind is an English translation of Eucharius Rösslin’s Rosegarten, an obstetrical text first published in German in 1513. Widely read and translated, the Rosegarten was written for midwives and contains the earliest obstetrical woodcuts. The first English edition, based on a Latin translation, appeared in 1540. The second English edition was revised by the physician Thomas Raynalde in 1545. Raynalde incorporated the work of other authors, including illustrations and descriptions from Vesalius’ Fabrica, such as these torsos. Thomas Geminus (d. 1562). Compendiosa totius anatomie delineatio… London: Thomas Geminus, 1559. Geminus’ Compendiosa totius anatomie delineatio includes copies of many of Vesalius’ illustrations with simplified landscapes, including the one seen here. The Compendiosa was intended as a text for British physicians to use as guidance when dissecting corpses of criminals, a practice legalized by King Henry VIII in 1540. The first edition of the book, published in Latin in 1545, gives Vesalius an acknowledgement, but the two English versions that followed—including the 1559 edition, from which this image comes—do not. Godefridus Govert Bidloo (1644-1713). Anatomia humani corporis… Amsterdam: J. à Someren, 1685. Bidloo’s Anatomia humani corporis includes 105 anatomical copperplate engravings, recognized as some of the finest illustrations of the Baroque period. Most anatomical books published in the late 16th and 17th centuries emulated the Vesalian style, with animated figures set in picturesque landscapes. Bidloo and Gerard de Lairesse, the artist, took this approach with their skeletal figures, such as this one contemplating an hourglass and the inevitability of time. The rest of the plates departed from this tradition, being realistic drawings of dissections. Table 5 shows the skull and scalp in the first figure and the dura mater and cerebrum in the second. Godefridus Govert Bidloo (1644-1713). Anatomia humani corporis… Amsterdam: J. à Someren, 1685. 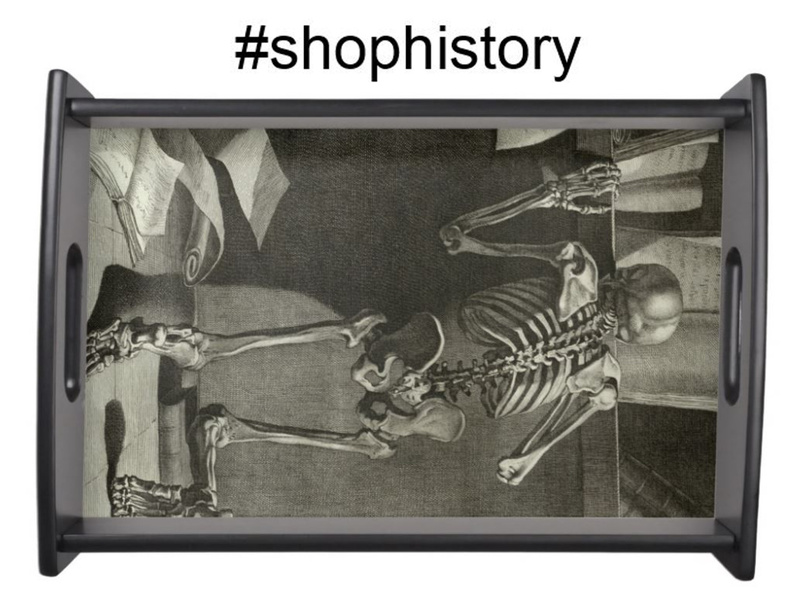 Bidloo’s Anatomia humani corporis includes 105 anatomical copperplate engravings, recognized as some of the finest illustrations of the Baroque period. Most anatomical books published in the late 16th and 17th centuries emulated the Vesalian style, with animated figures set in picturesque landscapes. Bidloo and Gerard de Lairesse, the artist, took this approach with their skeletal figures, such as this one contemplating an hourglass and the inevitability of time. The rest of the plates departed from this tradition, being realistic drawings of dissections. Giovanni Domenico Santorini (1681-1737). Anatomici summi septemdecim tabulae. Parma: Regia Typographia, 1775. Santorini, a physician and professor of anatomy in Venice, made extensive discoveries during his lifetime, most notably identifying the accessory pancreatic duct. Santorini’s student, Michael Girardi, compiled Anatomici summi septemdecim tabulae and published it 38 years after his mentor’s death, including Santorini’s previously unpublished anatomical drawings and observations. The discoveries shared in this work include what is now called Santorini’s plexus, an important contribution to pelvic anatomy. He also described and illustrated facial structures, as seen here, including novel findings still useful to medical professionals. The book is considered one of the best anatomical works of the 18th century due to the high quality of its images and descriptions. 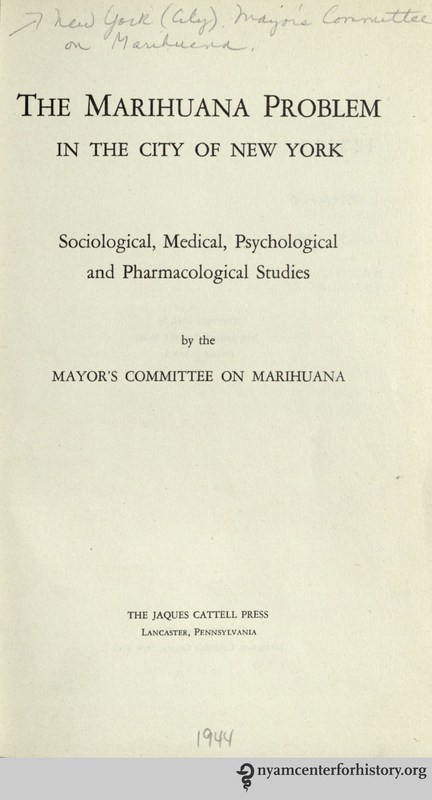 On May 1 and 2, The New York Academy of Medicine and the Drug Policy Alliance co-hosted a conference, The LaGuardia Report at 70. Featuring more than 25 speakers, including historians, policy experts, political figures, and community organizers, the conference provided a forum to understand the state of marijuana regulation and enforcement in New York and to see the current debates in the context of over a hundred years of public policy fights around drugs and drug regulation in the United States. For the conference, we created a small exhibit featuring facsimiles of materials from the New York Academy of Medicine’s Committee on Public Health Relations archive, as well as the original 1944 report. We are pleased to share the images with you on our blog. 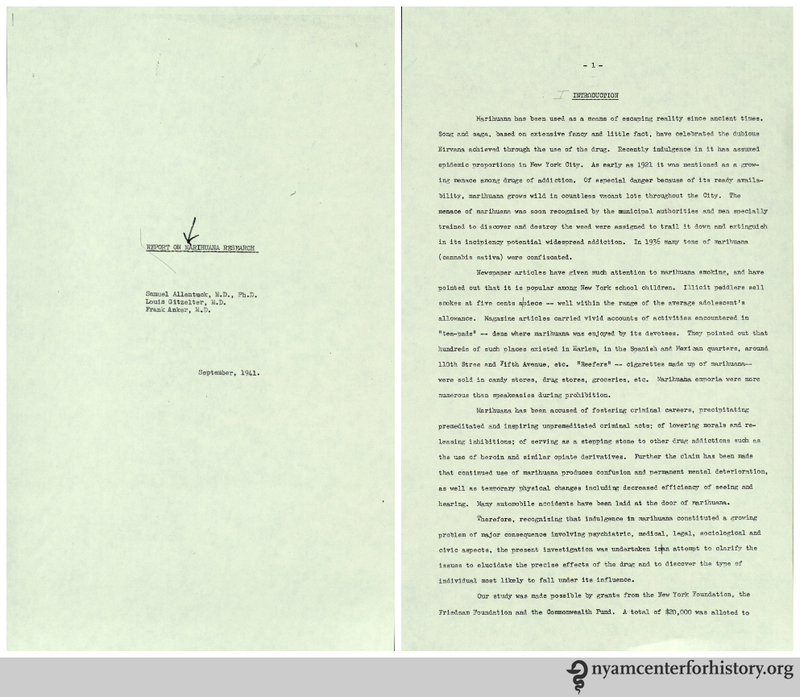 The LaGuardia report, formally titled The Marihuana Problem in the City of New York, was published in 1944. 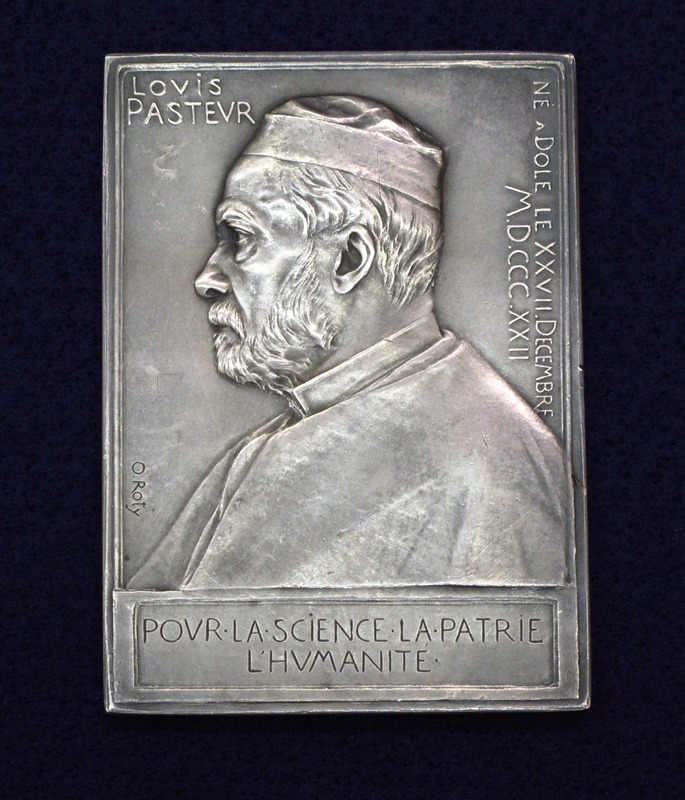 Medal issued to commemorate Louis Pasteur’s 70th birthday, 1892. Medals, amulets, badges and prizes play many roles, whether acknowledging significant figures in their fields, commemorating events, or giving insights into beliefs about health. Over 275 medical-themed items from the collection of Dr. Ira Rezak, currently on display at the Augustus C. Long Health Sciences Library at the Columbia University Medical Center, provide a rich and varied exploration of these roles. The objects in the exhibit range from a 70th birthday medal for Louis Pasteur (1892) to a 16th century German amulet used to ward off the bubonic plague, a Canadian medal from 1994 celebrating the role of white mice in medical science, and the New York Academy of Medicine medal by Harriet Whitney Frishmuth, among many other medals representing medicine in New York. 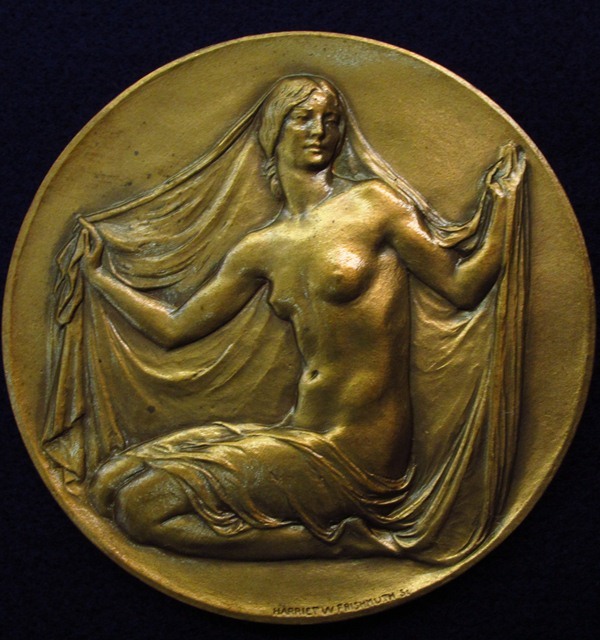 Medal of the New York Academy of Medicine, 1928, by Harriet Whitney Frishmuth. The exhibition, Mirroring Medicine, is drawn from Dr. Rezak’s medal collection, formed over 50 years, and one of the most important in private hands. Dr. Rezak is a NYAM Fellow and Professor Emeritus of Medicine at the State University of New York at Stony Brook. The exhibition is on view until January 11, 2013 and is open from 7am to 9pm on Lower Level 2 of the Columbia University Medical Center’s Hammer Health Sciences Center. Individuals without Columbia University or New York-Presbyterian Hospital identification should make arrangements to visit the show by emailing hslarchives@columbia.edu. A photography exhibit by NYAM Fellow Jeffrey M. Levine, M.D., is on display through September 21, 2012 at the National Arts Club (15 Gramercy Park South). The exhibit, The Changing Face of Aging Across America, is the first stop in a year-long tour of these images, which will be shown in six teaching hospitals around the country. 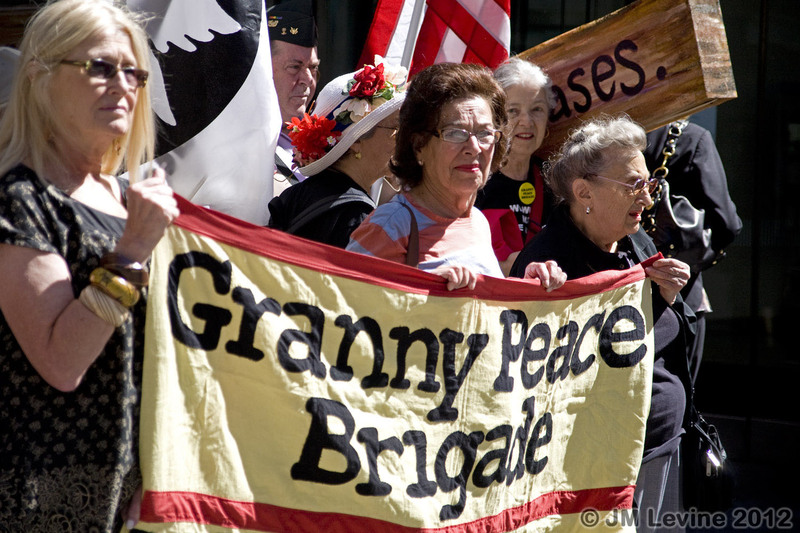 Granny Peace Brigade in Times Square. Photo: Jeffrey M. Levine, M.D. Dr. Levine is a gerontologist and wound care specialist with a longstanding interest in photography. He has studied at the Art Students League, the International Center for Photography and the School of Visual Arts. For the past two decades he has been documenting the experience of aging in America through photographs that celebrate the activities and communities of aging individuals, but also remind us of the many challenges faced by this population, our largest growing demographic. 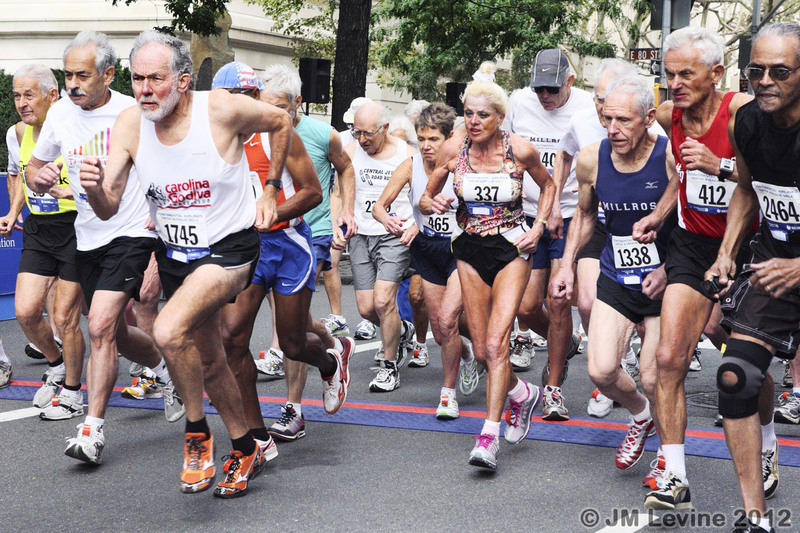 Runners in the Over 70 Race on Fifth Avenue. Photo: Jeffrey M. Levine, M.D. An earlier exhibit of Dr. Levine’s photographs, Aging Through a Physician’s Lens, was displayed in the Presidents Gallery at NYAM in 2009.